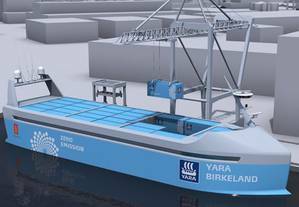 The Norwegian company Yara is currently building a full-electrical containership fitted with an autonomous control system: the Yara Birkeland. During a recent visit to a major maritime conference, imagine my surprise when most attendees - some 200 executives from the maritime sector - discussed autonomous shipping in terms of its risks. The room seemed full of objections and doubts. What if the computer malfunctions? Somewhat understandable in view of the pressure put on the sector by strong international competition and slim margins. Existing companies are used to a certain turnover. They spot new competitors on the horizon and aren't happy with the prospect. But the danger of thinking in terms of risks is that you could literally end up missing the boat. A good example is Kodak, the company responsible for developing the first digital camera. Kodak saw the digitisation of photography that subsequently took off around the world as a threat to its existing business. It hived off its digital activities, and ultimately had to file for bankruptcy in 2012 (although the company subsequently re-launched in 2013). Which is why I would recommend turning the picture on its head, and viewing autonomous shipping as an opportunity rather than a threat. There are more than enough opportunities to grasp. You can create new business by putting new vessels on the market. Or you can save costs on your existing fleet. And installing an autonomous control system allows you to limit risks. I expect that in due time, we can expect lower insurance premiums as a result of fewer collisions. And autonomous shipping is more efficient: on average, human-controlled vessels consume more fuel than automated vessels, since people have moods and personal preferences. Computers, on the other hand, simply chart the optimal route. Autonomous driving is coming to the fore. Here, 'autonomy' kicked off with automatic parking. I think we can expect a similar development in autonomous shipping. And autonomous shipping out on the open sea will probably be a lot easier to introduce than autonomous driving in streets full of playing children. We'll still need crews to stay on board the ships for certain tasks, but they will have more time for other services and important focus areas like safety. My advice? Give it a try. And Oceanos can help. This start-up is installing an autonomous shipping system that it has developed in-house in existing ships with lengths of 2 to 33 meters. Wondering when the first fully- or partially-autonomous vessel with a length of over 100 meters will enter the port of Rotterdam? My prediction is within the next three years. Mare Straetmans is Managing Director of PortXL, an international, open innovation program. Within the program's term of 100 days, mentors provide 10 carefully-selected start-ups with intensive coaching support to help get their business off the ground. The candidates have access to a network of over 150 mentors, investors and corporate partners. The accelerator program is an alliance between Van Oord, EY, the Port of Rotterdam Authority, Erasmus Centre for Entrepreneurship, Vopak, Uniper, Rabobank, Port of Rotterdam Fund, Thales, Rotterdam/The Hague Airport, the City of Rotterdam, InnovationQuarter and Royal Boskalis and specifically focuses on port-related industry.